Videos are an essential part for businesses. Video hosting for business thus requires a variety of feature set customized to particular business need. VdoCipher business video hosting has a full package offering for all type of businesses. The following post mentions the solutions for each of the industry and relevant features in detail. The first part of blog has explanations on basis of features while in the second part we discuss our video solutions for businesses in Corporate Training, E-Learning, Publishers, Marketing and Movies & Online Television. At VdoCipher we have optimized every stage of our video hosting solution, and here I go through the feature set that makes VdoCipher the ideal secure video streaming package for your business requirements. Video is uploaded from device using IBM’s Aspera high-speed transfer, and stored privately on Amazon S3 Bucket. Minimizing time of video upload is an absolute priority for us, and for this we use services from IBM and Amazon to ensure that your video upload takes minimal time. We have fast-tracked the process so that you can start your video customization right away, and get back at your business. 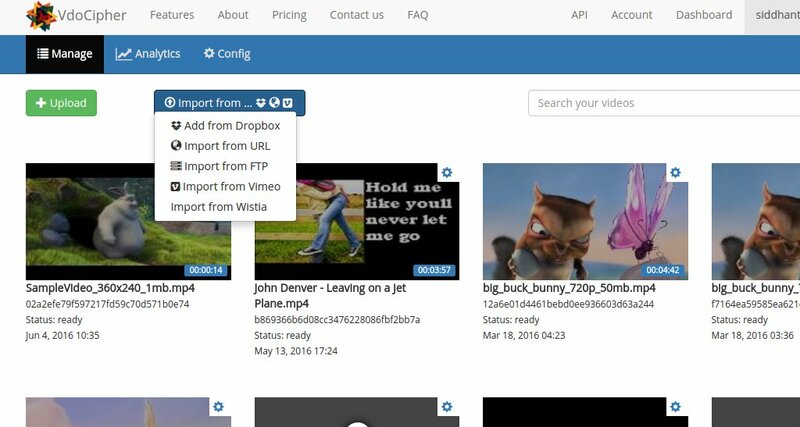 You can also use Dropbox for transferring your business videos directly to our servers. We also enable video transfer from Public URL, and also from user accounts on Vimeo Pro and Wistia. We have setup our custom encoding protocol as an Amazon EC2 instance, to speed up video encoding. As encoding takes considerably more time in the process of video upload, we recommend that for videos of size greater than 1GB you use offline encoders, or any of the free online options available. You can then choose to cancel video encoding option at the time of upload. Your Video Dashboard serves as the one-stop destination for you to manage your videos effectively. 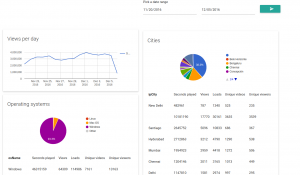 We have enabled a grid view for the dashboard for the ease-of-use. Video upload and video settings can be directly changed at the Dashboard – for each video you may change the thumbnail, bitrate and player size directly from the dashboard. Encoding can occur in different bitrates for desktop and for mobile. The easy-to-use GUI means that once you start using VdoCipher you can directly start using secure video hosting without further customization. Every video uploaded is assigned a video ID, and is identified by its name. You may search your videos using your video ID and name. You can directly tag your videos for easy categorizing and searching for videos within the dashboard. Security of video content from piracy is a key concern associated with video hosting for business. VdoCipher ensures that the content streamed through us is protected from any downloader, plugin, software or hack. To cater secure business video hosting requirements , VdoCipher uses a set of proprietary encryption and watermarking technologies. Features of the online DRM that the video player uses are described below. We employ CDNs provided by Amazon CloudFront and Akamai to ensure that your videos reach your viewers quickly and with minimal latency. CDNs work on the principle of caching of videos on local servers, so that when viewed in a vicinity of the Point of Presence the video can be smoothly seen. We have developed our own custom server-side encryption for storing and streaming videos on Amazon servers. VdoCipher encodes video files as multiple copies, of different resolutions and bitrates. This gives your users choice to watch low bitrate videos when they would like to optimize their data usage. We create our own one-time user playback URL, at the time of video player initialization. This URL is only accessed through the custom embed code in the player, and is therefore not public. The encrypted stream content is encrypted inside the player with a dynamic key. Our proprietary key transfer protocol is entirely private, unlike the public or semi-public key transfer involved in HLS, HTTPS and RTMPE. Using dynamic watermarking you can deter piracy through stream recording software. A watermark is laid on the video player, which identifies the user session like ip address, user id, email id, time stamp etc. Read on to learn more on our dynamic watermarking technology. 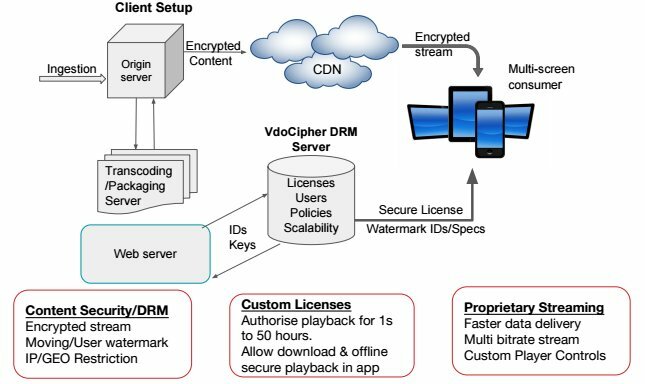 Along with encryption and watermark to prevent download of content, VdoCipher provides an added layer of security from link based sharing. This is done through URL whitelisting. While other providers allow you to only restrict main domain site , allowing loop holes in security; VdoCipher allows you to whitelist exact page url e,g whitelist can be set on www.example.com/blog/paid_course and www.example.com as well. Restriction on the first url will ensure that your videos dont play outside the login access of users. VdoCipher player is a progressive media player – the stream is buffered from the start of playback. The player buffer is conserved throughout the period of playback, so that your viewers can move ahead and back within the video playback without the need for additional buffering. This means that your viewers will need less bandwidth for your videos. We provide customization so that the video player embedded is in sync with your website design. Our custom features include additional controls such as player seek, changing sound, toggle full screen and adding custom skin. Additional custom offerings include adding buttons over player to capture email ids or to take the viewer to your website pages. All of these customizations are possible with VdoCipher custom player. You can set the image for your video thumbnail to make your video more appealing. This would be the image shown on your video player before playback starts. Designing a good thumbnail image makes it much more likely that the viewer will watch your video. We have a well-documented set of APIs for your developers to integrate VdoCipher media player on your website. You can use our WordPress plugin to embed your videos on your WP site. This feature is very easy-to-use – it can be done through WordPress shortcodes. Videos can directly work in all browsers (chrome, firefox, IE, Opera) on all desktop(Windows, Linux, Mac) devices. Browser HTML5 playback is available. We also provide iOS SDK, for seamless video playback on your iOS app. Using VdoCipher you can enable Server Side Ad Stitching – so that any ad that you may wish to show to monetize your video is stitched directly to the video at the server side. This prevents any reliance on browser, as well as ensuring that your video ad is not blocked by ad-blockers. You can integrate VAST (Video Ad Serving Template) compliant ad networks with VdoCipher streaming player, to strengthen your monetization strategy. Using VdoCipher you can access detailed analytics per video for viewer data, using our APIs and dashboard features. Our Pay-per-use model ensures that you are charged proportionately to the bandwidth and storage usage you require. Please visit the pricing page or send us a mail for additional info. For businesses, training of existing and new workforce is key to their constant evolution. Adapting to the changes in the market environment swiftly is key to the well-being of any business. For this reason increasingly a performance-based paradigm is being adopted to enhance learning at the speed of work. VdoCipher appreciate this need of modern day business video hosting need, and we have designed our online video hosting solution to enable you to impart time-efficient and targeted training through videos. This paradigm signifies learning at the rate of performance, and here the 10% time devoted to formal training is designed to provide an impetus for the 70% experiential learning and the 20% Social Learning. With VdoCipher you can build a video CMS in combination with popular CMS such as WordPress, Drupal, Joomla! and Moodle. Using VdoCipher you can securely host your corporate training videos. For this you can directly upload videos from your device, or from other Cloud Storage (Dropbox) or Video Hosting platform (Vimeo Pro) that you use. Our double layer of security ensures secure storage, encrypted stream delivery and OTP authentication, thereby making sure that your business videos are not made available outside your organization. Send a mail to info@vdocipher.com for consultation on your custom business requirements. Video in E-Learning is increasingly being used in the space of K-12 education, as well as in preparation for university and professional exams. Video design is a very crucial element engaging learner attention. Schools and colleges may use flipped E-learning methods – using videos to engage students in a topic before class, for a more meaningful classroom interaction. Videos therefore have a strong ability to augment classroom teaching. VdoCipher appreciates the enormous growth potential in this space, and we work to ensure complete video security for e-Learning businesses. Check out our feature set to learn more about how we provide video hosting for E-Learning. With increasing emergence of mobile phone devices, we also have support for your Android SDK player. And also we have our own app that your subscribers may use to view our videos. We have also optimized the transcoding process, offering 1080p resolution at bitrates of 300kbps, and 720p resolution at bitrates of 200kbps. This comes from our learnings with working closely with many E-Learning customers, assisting them in providing high-quality videos for all kind of users at different user bandwidths. Feel free to send us a mail at info@vdocipher.com for a consultation on adapting a video hosting solution for your E-Learning business. Online video publishers are increasingly adopting a two-pronged multimedia strategy. YouTube offers publishers the opportunity to leverage a broader audience, a potential for vast number of pageviews and an opportunity for viral marketing. Using YouTube publishers can build an online audience. A custom video hosting solution is recommended for a more specific target audience – for example users who have already expressed interest, or paying subscribers, or both. VdoCipher offers publishers a secure video hosting platform for the requirements of your targetted audience. You can also integrate call-to-action at the end of the video player, for reaching out to your audience in a more targeted manner. Strategically locating the call-to-action at the end of the video ensures that the viewer sees the option to become a paying customer at the most appropriate time. Call-to-action can be incorporated at any time while playing the video. Our video platform enables you to optimize the user experience for your audience. Custom player skins. We have optimized transcoding, offering 1080p videos at a minimal bitrate for delivery at 300kbps, for low-motion videos, such as talking head videos, ensuring the best viewer. We also deliver video encoding at 512 kbps for audio solutions, a 16 time better quality than the max 128 kbps video that YouTube and Vimeo offer. Besides we offer Server-side ad stitching, ensuring that ads are integrated to the video at the server level rather than the browser level, preventing blocking from ad blockers. We also have support for your Android SDK, and also provide for multi-bitrate streaming using HLS protocol for iOS SDK. With the increasing popularity of mobile, our innovations in the mobile space enable you to reach the maximum audience. We have leveraged Amazon’s CDN network to ensure localized caching, ensuring that your multimedia stream reaches your audience at the earliest, wherever they are on the globe. Feel free to send us a mail at info@vdocipher.com for a consultation on adapting our video hosting solution for your publishing requirements. What are your priorities when you design your videos? Which are the critical stages in your sales cycle when a video will help? B2B brands require a different marketing strategy than B2C brands. Identifying your niche is critical, and designing videos specifically for that niche is most important. This is because the quality of your audience is the most important factor – you need your ads to appeal to your defined narrow audience, rather than to a general audience. For this you need to identify what appeals most to your target audience. For this reason we strongly suggest that you develop a video marketing funnel – a video marketing strategy from brand awareness to post-sale. This sales funnel approach should be centered on guiding your users throughout the purchase process. At VdoCipher, we offer a secure video hosting solution, for you to design your videos for your marketing strategy. Feel free to send us a mail at info@vdocipher.com for a consultation on adapting our video hosting solution for your marketing requirements. Entertainment videos, including mainstream movies, serials, or independent video content are responsible for most of the internet bandwidth consumption on the internet. 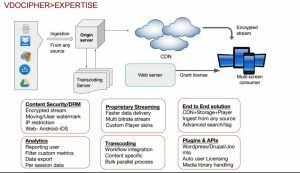 Streaming movies online involves a large workflow process, starting from upload, transcoding, streaming , ad-insertion and subscription management, besides securing content from piracy. VdoCipher video hosting solution provides the complete solution for the requirements for entertainment content hosting, helping you monetize your content most effectively, without fear of losses due to illegal sharing. For a full free version business video hosting trial, Register now at VdoCipher.